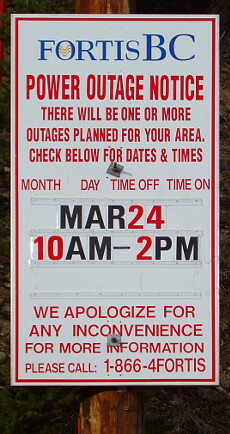 ​There is an announced electrical outage for next Tuesday March 24, 10 a.m to 2 p.m. This will effect all customers along Coalmont Rd including Coalmont and Tulameen. Also includes customers on Blackmine [sic] Rd. Approximately 524 customers are involved. The reason given is equipment repairs and upgrades, but another announcement posted on the web three days later indicates that they decided to do “Emergency repairs” along “Areas of Coalmont Rd, Tulameen Rd and Blackmine [sic] Rd as well. That action is purported to effect about 594​ customers. Have you ever wondered what services you receive from the Regional District for the rural taxes you pay? Come to a public budget meeting to find out. The RDOS finance staff will be in Princeton to present the 2015 financial plan. Wednesday, February 18, 2015 – 7:00 p.m. 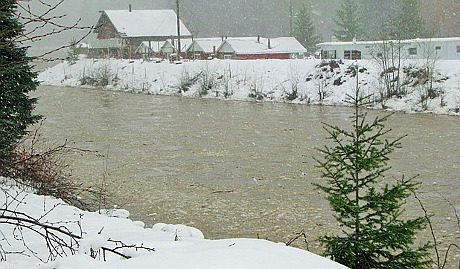 There is a flood warning for Coalmont and anyone along the Tulameen river. People are asked to remain on standby and be ready to leave town on short notice. Apparently there is a significant ice jam about 7 km up the river and it was already looking dangerous before it got dark. Fire Department volunteers have been walking about town and knocking on every door to make sure that people are aware of the situation. Residents are being told that if they hear a siren, to leave immediately and head toward Princeton. The siren will be from the fire truck. The last time there was a flood in Coalmont was in 1995 about this same time of year. That one caused considerable damage and it reached from the river up as far as the Hotel. Hopefully the dyke which was built then, will be protection enough if the current ice jam breaches. Being almost 20 minutes from the Princeton Hospital has always been an issue for emergencies, but regular health care has also been sparse in recent years. There has been much discussion about the operating room being closed down. Emergency services were even spotty for a while. Many people don’t have a family doctor any more. However, it looks like this downward trend is going to slowly turn around. Several organizations are mostly responsible for this. One is the Support Our Health Care (SOHC) society which has been active for several years. First to get 24/7 emergency services, and now continuing to work on a general plan to get better and adequate health care on all levels. Also, as a reaction to the low level of available care and lack of doctors, the Princeton Health Care Steering Committee (PHCSC) was established. This provides a mechanism for the major stakeholders to work together effectively. There is now a new web site where you can read what they are doing. Please visit www.princetonhealth.ca for details. One thing which you will notice is that the site is focused on recruiting doctors and other medical professionals to our area – specifically to Princeton General Hospital and the Cascade Medical Clinic. This is a first, since until now this function has not been fulfilled well. Continuing with our 2014 Area ‘H’ election coverage of the three candidates for a director to represent us, here is a report from the Princeton Chamber of Commerce All Candidates forum held October 29. Overall it was less engaging than the one here, due mostly to the strict rules and format which prevented real conversation with the candidates. Nevertheless, it was informative and offered us an important source of additional information about the candidates. Weber points out that there are all sorts of opportunities for young people such as sports and Highland Dancing. However, he mainly wants to promote growth by increasing the population. “Promote, promote, promote” he says. He suggests that when he first moved to this town it was more active. “We want to bring that back”. Regarding health care, he thinks it’s time for “hard bargaining, hard negotiation” with IHA (Interior Health). Weber said that “doctors and nurses are most important”. “Why are they leaving? We need to ask them. We need to grow this community”. He then reiterated his earlier solution “We need to do hard bargaining with IHA and advocate for our community”. Coyne was more nuanced, suggesting that we need sustainable staff on all levels. “The whole process needs to be managed”. Frandsen sees the retention problem as a competition with other communities. He also mentioned the idea of an expanded facility down the road and things like transportation for older people and education on how to avoid falls and such. A question about the Library was raised. Its funding will apparently be cut back, and the fact that Area ‘H’ does not pay taxes toward the library was questioned. (Residents currently pay $75 for an adult library card instead of a general tax. Ed.) Frandsen said “it sounds right to pay and share”. Weber said “more young people come out of Area ‘H’ than come out of the community”. Coyne seemed to understand the history of the issue when he said “Princeton Fringe would say yes in a heartbeat. Those in Eastgate, who are all going to vote, will say no”. “It’s a very good question for discussion among the communities”. The healthcare issue then came back to the discussion. Weber insisted that “we need amenities”. Coyne suggested that times are different and it’s not the same situation that it used to be: “I don’t have the answers.” Frandsen enhanced his earlier statement with, “we just need to get past that first hurdle”. “We need to get ahead of those other communities”. Coyne: “It’s a big question”. “People are still very emotional from the last time”. He recognizes the reality that we are left with when he says “People are not willing to participate at this time”. Nevertheless, he emphasizes a democratic process and says “I would have to meet with the communities”. Frandsen had no doubts: “I stand 100% behind it. We need a facility that is family friendly, and is top notch”. Weber, perhaps because of his own colourful involvement, described the issue in a more colourful manner. “It’s a swamp”. He went on: “(We need to) find out our costs out front … We can work something out”. “We don’t need to get split”. “(we can) rebuild that trust”. Weber: “We want to go in a slightly different direction, but Brad has done a good job with communities”. (I want) “More role for government, APC, etc. . . . expand governance role and use that to make decisions”. “Take it to the next level”. Coyne: “That’s a rather distasteful question”. He preferred instead to bring greater recognition to what has actually been done and sees the current direction as positive, saying “Thank you very much Brad!” “My goal is to continue on the work that Brad has done”. Frandsen: “You’re looking at a fresh face”. “No baggage”. Weber: charlsweber@nethop.net No site. “work in progress … it’s coming”. Frandsen: “leave it there” this is the backbone of our area”. Weber: “We need to bring younger people into it”. Coyne: “I’ve grown up on farms”. “It (agricultural land) comes up all the time when we talk about development”. “Agriculture is changing”. Weber: “Growth. We need to grow”. “If we get some growth, the rest will follow”. He used the words “positive” and “exciting” “We need strong presence in Penticton … Strong presence with IHA”. Frandsen: (quoting recent article) “47 percent of Vancouverites are considering moving out of the city”. “If we could get some of that money . . .Doctors will stay here”. As director “I’ll hit the pavement, running”. Coyne: “Thank you all for coming out”. “Thank you to the other candidates for running”. “Vote with a clear conscience – vote nov. 15”. Bob Coyne: Thanks for the opportunity to answer the questions that you have put forth for the benefit of your readers. 1 – How do you plan to support our individual communities and their differences? cases get representatives of all groups together to discuss issues as they arise. 2 – What committees and community groups have and do you participate in here? active with 4H for 25 years. 3 – How should the Community Forest money be divided? be approved by the board of directors of RDOS. 4 – What do you say to the people who feel threatned by the recurring Princeton pool issue? 5 – Are the 46% who are not full time residents equal to those who are here all the time? here and support the local trades. Charles Weber: Let me make an effort to answer some of the concerns you have asked about as editor of the Coalmont Courier. 1. How do you plan to support our individual communities and their differences? CW: Currently, there is a process in place to support these communities that the current director has been using. Most of these communities have community clubs, fire departments, ratepayers associations etc. and they have regular meetings where “the orders of the day” are discussed, Minutes taken and concerns forwarded to the elected Director. I plan to continue that process. As well those communities will have access to the Advisory Planning Commission that will be in place to support and advise the Director. Access for support for the various communities in Area H should not be a problem. 2. What Communities and community groups do you participate in here? CW: Presently, I am involved in a number of groups in the community and enjoying all of them. Bev and I are both involved in the curling club and curl at least once a week and I sometimes curl twice a week. We are both avid bridge players and play bridge once a week and I am currently teaching a bridge course for beginning bridge players. Bev and I are avid cross country skiers and cannot wait for the snow to fly. Every year for the past five years we take a group for an overnight trip to the China Ridge cabin. Always a challenge, and always a huge hit with the participants. I also belong to the to the Vermillion Forks Field Naturalists and currently sit on the board as the vice president. I also have a membership in the Museum Society. 3. How should the community forests money be divided? CW: The community forests money is currently shared between the town, Area H, and the Upper Similkameen Indian Band. I am not entirely sure how much money is in that account for Area H and would only be going by hearsay were I to hazard a guess. Any use of funds or commitment of funds would have to involve a consultative process with the whole of Area H. My understanding is there is a substantial amount of money from the community forest fund. 4.What do you say to the people who feel threatened by the recurring Princeton pool issue ? CW: Princeton is in need of amenities if it is going to attract Doctors, health care professionals, and necessary professionals to the community. The community of Princeton is most likely going to forge ahead and pursue a pool and they will approach Area H for support. At that time Area H will have to make a decision. Using the APC (Advisory Planning Commission) people will be consulted and asked their opinion. Any venture into the pool will have to be affordable, not involve a huge tax increase, well managed , on budget, and have people behind it. Area H will not commit to a project that does not have substantial outside funding, provincial funding and support from industry. Resources have been taken out of this area for far too long and little has been returned. Time a few things changed. 5. Are the 45% who are not full time residents equal to those that are here full time? CW: Of course, Ole. I am surprised you would ask such a question. We are all equal and the strengths of one group should enhance the strengths of another. I see very little reason for those groups to be polarized and will work to bring the residents and non-residents closer together. * Four hours of intensive internet research and many attempts at telephone communication over a period of several days, has not resulted in contact nor information about Jamie Frandsen which is directly relevant to this article. The Coalmont Hotel is sponsoring an All Candidates meeting on Tuesday October 28 at 7 p.m. and everyone is invited. This is an opportunity to ask questions and hear what the three candidates for Area ‘H’ director have to say. They will each have an opportunity to speak, followed by questions from the floor. Unlike the similar event sponsored by the Princeton Chamber of Commerce, this will be much more relaxed. After the meeting, which shouldn’t be too long, everyone can continue the discussion in the meeting room or in the saloon. People from all the communities are encouraged to come, and this should be especially convenient for Tulamenians who will not need to go all the way to Princeton to hear what the candidates have to say. The next term will be increased from three to four years so it is even more important that electors make a good choice. Election day is November 15 and Voters in the Regional District of Okanagan-Similkameen are eligible to vote using a mail-in ballot. To receive a mail-in ballot package you must first submit a Mail-in Ballot Application to the Regional District office between October 20, 2014 and 4:00 pm November 7, 2014. Click here for more information on Mail-In Ballot Voting. As most people know by now, Saturday November 15 is election day and we’ll be voting for a new Area ‘H’ representative. The incumbent, Brad Hope will not run again. There are three candidates. Charles Weber, who has run before and is known to many here; Jamie Frandsen, who is a newcomer at Allison Lake; and Bob Coyne, who has lived in this area all his life. Many Coalmontians will be happy to know that as a result of continued dialogue with Vermilion Trails Society as well as various BC motorsports clubs and related organizations, the BC Ministry of Forests, Lands and Natural Resource Operations has responded with a revised strategic plan. 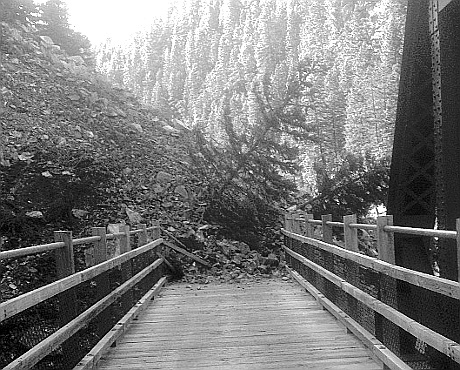 As a partner in the management and development of BC’s rail trails, I am writing to inform you of a revised strategic approach to rail trail management by the Ministry of Forests, Lands and Natural Resource Operations. Perhaps the statement can be best summed up with the recognition of the fact that the past approach has not been realistic. The ministry sees the need to adopt a more realistic approach to rail trails management, one that represents the geographic and demographic variability across the landscape and supports the multiple interests of the communities that the trails pass through. 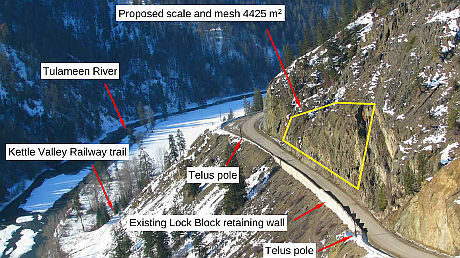 Available funding needs to be prioritized to specific trail segments using a risk management strategy based on community support, use levels, type of use, and tourism potential. There is recognition of the importance of non-motorized use and consideration of how everyone may be able to work together. In many communities along the trails, non-motorized use provides residents and visitors with exceptional, high quality recreational opportunities. Centered around developed areas where use is highest, non-motorized designations protect public safety, ensure an enjoyable recreation experience, and minimize conflicts. Non-motorized trails also offer a great opportunity for the development of destination tourism. However, it is clear that there is a commitment to support motorized use where it is appropriate. The government also recognizes that off road vehicles need to have ways to connect between Greenway segments across the province. In the more rural and wilderness portions of the trails, non-motorized designations are impractical to implement and not always supported by local residents. Due to higher ORV use in these areas, trail surface conditions tend to deteriorate and cycling use is lower. Managing these types of areas for non-motorized use does not justify the exceptional costs required to maintain high quality tread surfaces. This could not have been done by any one person or organization. We can expect the delays from road work on the Coalmont Road to continue until the end of August. It’s a big job and they will be working 7 days a week. Most times they hold up traffic for about 20 minutes before they let people through in both directions. Rock scaling 4425 m2 of slope to remove loose rock and debris. Supply and Install 192 m of rock bolts, 85 m3 of shotcrete, 16 m of horizontal drains and 4425 m2 of slope mesh.